Amanda is on piano, all selections. Flute and saxophone solos are by Phil Bodner. Trumpet solos on big band arrangements are by Nick Travis. 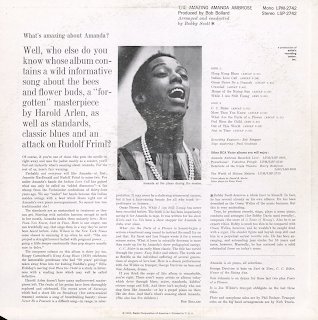 From the back cover: C. C. Rider is an early blues classic. The title has varied through the years; Easy Rider and others. The words are as flexible as the individual suffering of several generations of singers of love lost. Here is a classic performance with Joe Wilder on trumpet, George Duvivier on bass and Osie Johnson, drums. Also from the back cover: Bobby Scott deserves a whole liner to himself. In fact, he has several already on his own albums. He has been described as the Orson Wells of the music business. But that is very misleading. True, he produces records, sings, plays a mean piano, conducts and arranges (for Bobby Darin most recently), composes (the score of A Taste Of Honey). Also he is a expert vibist. Bobby is much too thin to be compared with Orson Wells, however, and he wouldn't be caught dead with a cigar. His slender figure and boyish mop still cast him in a perpetual enfant terrible role. He has been arranging and astounding jazz circles for 16 years and more, however. Musically, he has matured into a solid substantial force on today's scene. 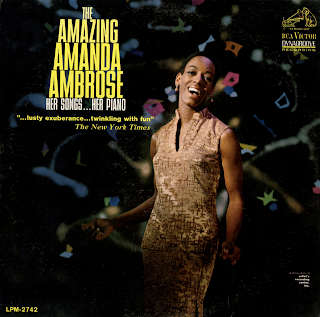 From Billboard - July 6, 1963 (Night Club feature): Amanda Ambrose is another in a long line of "overnight discoveries" who burst upon the night club-record-TV scene – after long, tough and hungry years, Miss Ambrose is a highly polished performer with tremendous versatility and it's apparent that her years of coming up the hard way prepared her well. Recently signed by RCA Victor, which released her first LP. "Amanda Ambrose Recorded Live!" She is currently on night club tour as was caught at "The Living Room: in Cincinnati. She is, in fact, a more powerful attraction in person than on record. The album work restricts her natural talent for blues, jazz, fold and her big talent as a pianist. Her feeling for a lyric and her solos combine to make an act that proves the old vaude line, "Nobody sleeps while I'm on." Working to a fairly noisy audience, she not only quieted them but grabbed their attention for the rest of each set. 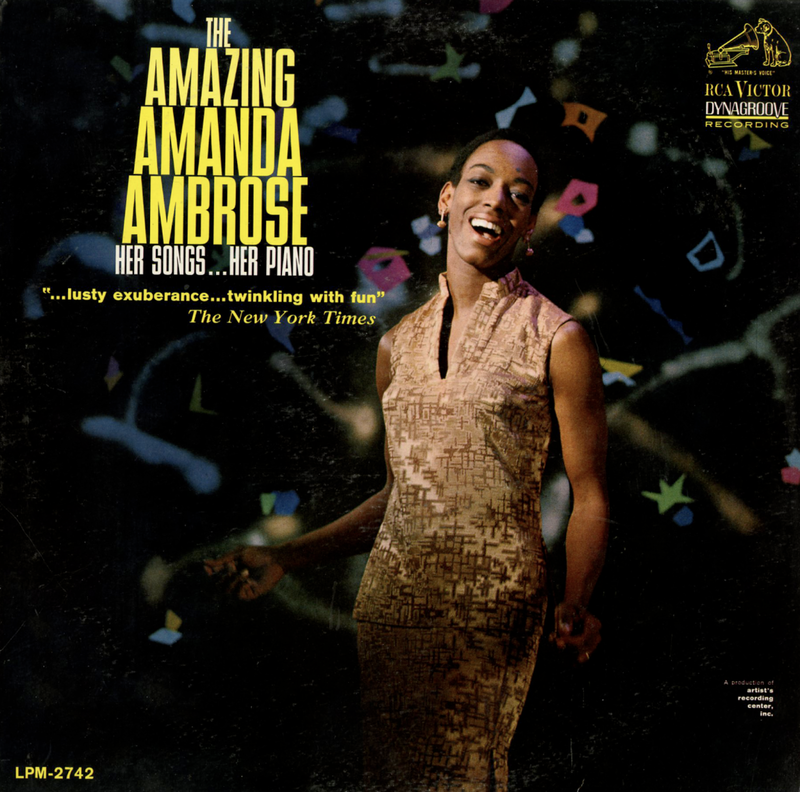 She is very much at home with gospel or spiritual numbers and this was, for the main, the Amanda Ambrose that the LP introduced. But she introduces her night club audiences to the full scope of her talent when she sells in almost desperate style jazz, ballad, and folkish tunes with equal aplomb. Her version of "Guess Who I Saw Today, My Dear" dictates attention and appreciation.